Got CTDon's Honey Ribs cooking away and went for a quick ride on my bike this morning. Those hills that seem like molehills in the car sure get big when you have to pedal up them. I've got some work to do around the house...scrub the carpets, trim some trees and put the brush by the curb for pickup. Mowed the lawn last night. The wife wants to wing it tomorrow...whatever she comes up with we'll do. She was talking about going antiquing last night. Who knows though. Nothing too exciting for this weekend. This morning I teach/coach a student of another teacher for a 2 hour lesson - it will be enjoyable. Not sure what we'll do this afternoon - had thought of going to get bedding plants and put them in pots, but it may still be too early, considering they were forecasting 60% chance of snow flurries this morning. Tomorrow, nothing really planned yet - we'll probably just wing it and do whatever. It would be nice to get out on the bikes if it's nice enough -- maybe should plan a picnic or something since it's suppose to be 17C/68F tomorrow. sunday, my birthday, going to disneyland to pick up my free gift card, dinner with family and friends, and find out what i got! Though i know it will be packed because its mothers day, which was why i opted to not go to disneyland for dinner and all cause reservations would be booked. Last edited by DC; 05-09-2009 at 04:04 PM. New faucet, the only hitch was the new one didn't include gaskets, so I called the wife who was out erranding with the kids and requested two cone washers for 3/8tubing, she came home with the right stuff, but they required some customizing anyway. While waiting for her to get home, I removed the plywood covering access under the spa tub, and found a copper pipe in 'near burst' condition, so that will be on the short list to repair, have surplus pipe/fittings so it'll be quick/cheap. Installed some salvage wainscote panels instead of the plywood for a better look, it really did spiff up the overall appearance. Next is to prime the walls, wainscote, cabinet and paint all the same color as the downstairs bath. Then seal the subfloor with a couple coats of urethane, cover with adhesive tiles, trim it out and it'll be about done. So....an unexpected turn of events, yet productive. The free beveled mirror that has been leaning against the wall will get a frame made from lumber milled with chainsaw from our own trees, that will give a nice touch. The other small detail is a shower curtain rod(80"), and a fabric outer shower curtain. What? You mean it isn't a term of endearment??? What if it is meant as Handy Manny? Would that make it better? Or what about Manny as in Mannywood which loosely translates to "he who takes women's fertility drugs"....no wait, that makes is worse. All in jest good sir. Your last response to Plymouth made me search desperately for The Man Show clip for husbandly duties. That's the one where you can hire a gay guy to stand in to sit through romantic movies and cuddle and listen to her talk incessantly. Couldn't find it, but for some reason it doesn't make it any less funny to me. Work-grill pork chops-work-watch baseball-work-sleep-work-listen to Tiger's game while working-grill hamburgers-work-watch Red Wings-sleep. Winging it for the weekend sometimes works. :-) After teaching yesterday morning my son and I went for a 2 hour bike ride (no dog this time, so I could actually get it in the 21st speed and prevent from wiping out as I did the other day with her along). When we got back the wife said that was a mother's day present in itself -- to have that time alone in the house. Damn, I could have saved myself $160.00 from buying her the gold and diamond "mom" pendant if I'd known that. Friends from out of town who we haven't seen before Christmas came into the city and took us out for dinner. So that was a nice treat to be with "other" adults for a change. Lazed around this morning in the veranda/sun room, made brunch for the Mrs. and hopefully will get out on the bike again this afternoon, since it's nice. So far, a relaxing weekend! 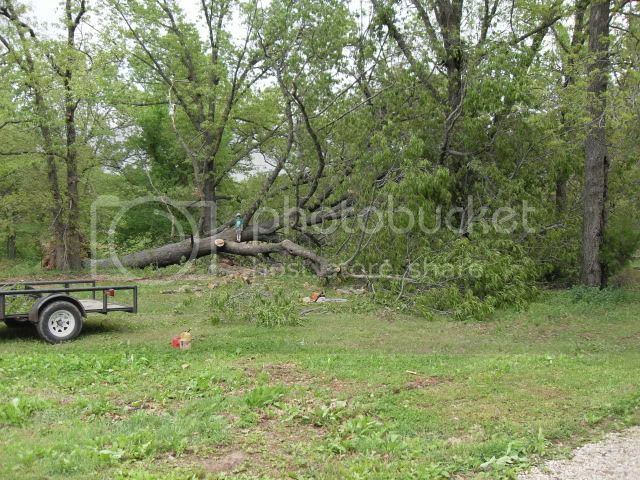 My weekend started Friday morning with straight line winds of 90mph for 30 minutes took out 2 trees, one of which was probably 100+ years old. So Friday from 11 am till 5pm was spent with a chain saw in hand and a 4 year old helper! Woodchuck were are you? Had my 4 year old stand in the tree to put a bit of perspective on how massive this thing is. Thankfully no where near the house. Saturday new brake rotors and pads all the way around on the van. Plus a visit from my beloved(lol) in-laws to see the new baby. Saturday night was spent in the mall with my 13 year old daughter looking for the perfect graduation dress. She loves shopping with me as I am a sucker for dropping some serious cash on my girls. Dress, shoes and some fake bling and she was happy. Sunday church and then dinner at our house with friends. Monday more tree cutting. Seriously, Woodchuck how far away from SW Missouri do you live?